For some people, changing their Smartphones is a regular thing – very regular that they just don’t care about the device they had at a particular time. However, it’s sure that the ‘some’ people do not care much about the data they have stored in their Smartphones, including the photos you have taken, music tracks that you do listen to, contacts you have stored in the device and movies if you listen to them. Or, it’s sure that they are using a tool like Wondershare MobileTrans to transfer information from one device to another, thus having the process simplified. Well, if you have not heard about MobileTrans from Wondershare, it’s the best time to start, as we are going to have a fully-fledged review of this productive tool, from top to bottom. First, it’s better to have an overview of the tool, we suppose. 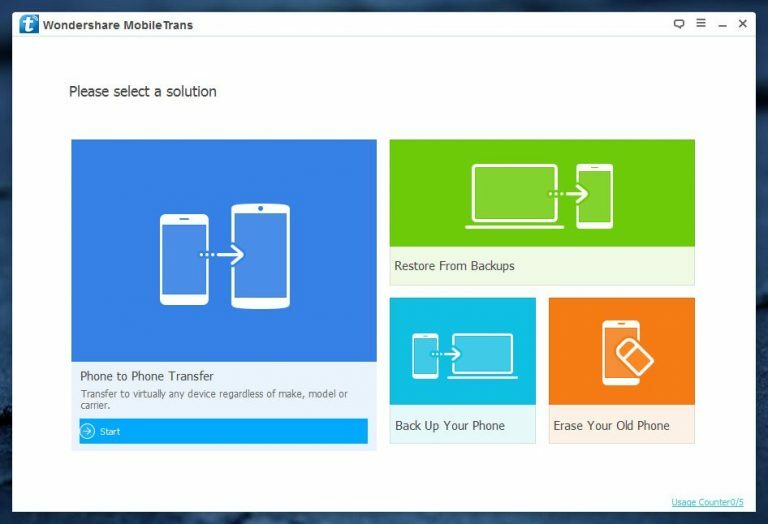 As we said, Wondershare MobileTrans is a tool that simplifies the process of transferring data between the two different Smartphones you have. You might be purchasing an all-new OnePlus Two, leaving behind the Moto G of yours there. You will be able to transfer information such as your contacts, music, videos, apps, call logs and text messages. 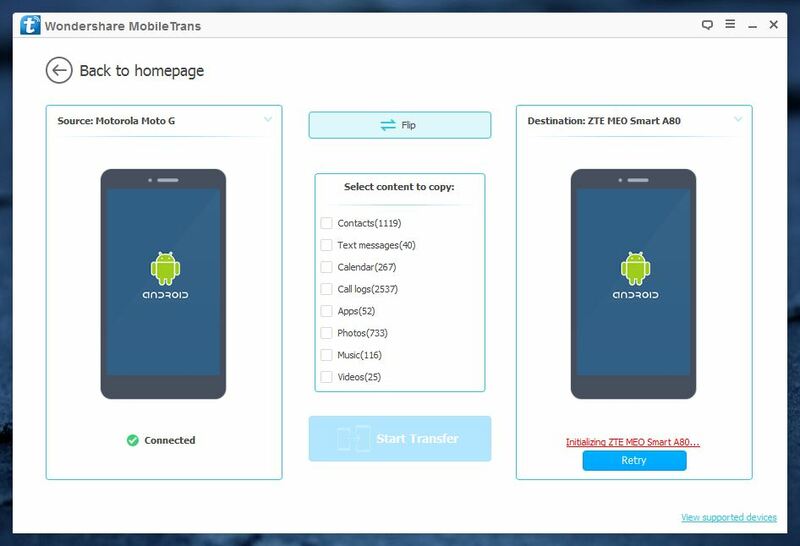 Although the availability may vary according to the platforms of both devices – just simple as you cannot transfer iOS-based applications to an Android-based device. In brief, MobileTrans would be a good companion for two-way data migration between various Smartphone platforms, including iOS and Android. So, that’s about the base, and we shall have a deeper view on different aspects of the tool. Despite being a Windows-only tool from Wondershare, Wondershare MobileTrans supports a wider range of devices, running on various platforms. However, as we said earlier, we might have to compromise some features in some platform combinations. 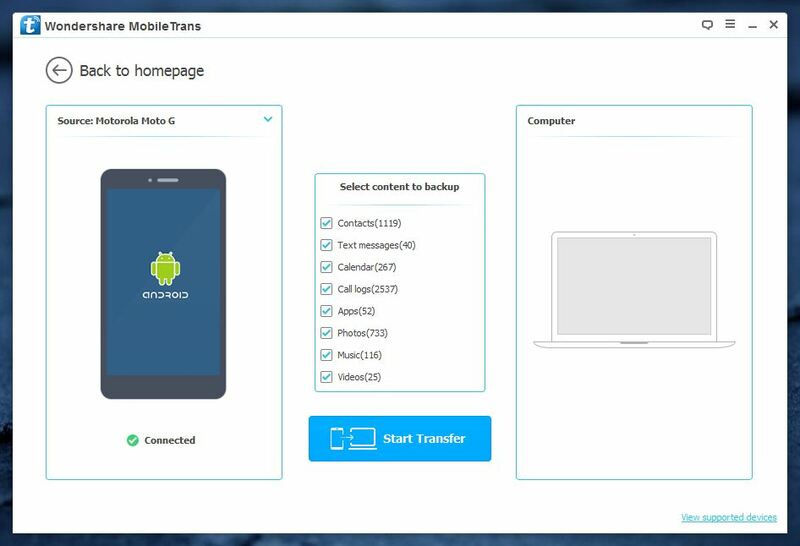 You can use MobileTrans to transfer data between Android, iOS, Symbian, and BlackBerry. In addition, when we come deeper into the case of Android, we can find support for Android v5.0 Lollipop as well. And, as we consider the case of iOS transfer, you can transfer data from a variety of sources, such as another iOS device and an iTunes backup file. Also, to be noted, a huge number of devices are supported by the interface. It has to be noted that Wondershare MobileTrans offers support for Apple iOS 9 and Android M as well — so that you can backup your data when you’re up for developer-oriented stuff. When compared to other tools for the same purpose, UI of Wondershare MobileTrans is an impressive one from the usability point of view. Once you have connected both the devices and opened Phone to Phone tab, you can see the two devices in two positions and you have the option to toggle the position if you like to do so. After that, you need to select the types of information you would like to transfer from one device into the other. Once you have done with the selection, you can click the Transfer button to start the copying. 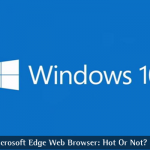 It is natural that anyone would love the UI, given that he or she has basic skills to use a PC. Also, for each and every task, there are Wondershare MobileTrans guides available, which is a good thing. The best thing is that you can backup your data in the phone, such as contacts, media files, videos etc. Once you open the Backup tab, you can understand how easier the process really is. The third feature, most important in this era, helps you delete data in your phone forever. It would be useful when you are giving the phone to someone else and want the data to be confidential as it had been. In light of all these, we are confident enough to call Wondershare MobileTrans one of the best tools to get help from when you need easier data transfer. Considering the price of $39.95, the deal becomes a kind of steal deal. By the way, we have a coupon WS2015 that you can use while purchasing the tool. You can use it to have a discount of $10 when you check out, thus making the amount to $29.95! Make sure you utilize the coupon. You can purchase Wondershare MobileTrans from the official store of Wondershare Apps. Well, I’ve had heard about the devices that can help transferring contact details from one SIM to another but have not heard about this device or any such device. It is great that this can keep us away from the hassle of transferring all our data from one phone to another when we buy a new phone. One thing that can make this app more interesting is the integration of cloud back up. Suppose, I have a phone and all my data is stored in the phone. If I lose my phone then how can I transfer my data to new phone even if I have this new app. If this app can store our data on a secure cloud server then download it to our new phone from that cloud server then it’d be great. I must say you have organised the content in readable and understandable manner. Thanks for sharing ! Thanks for this great software, this resolve my big problem. Now I can save my lot of data into my computer by which we can easily recover our all data. Thanks for this review. Many times I faced problems related to data loss, but this software prevent all these type of problems. Now we can easily save my phone’s all data into my computer. How can I transfer data from iCloud to Android? This is too much good , I like this software so much. I used this Wondershare MobileTrans app. Its very easy to use. Such a great tool you reviewed. I actually need this tool. Transferring complete data from one device to another is never so simple. I am planning to change my smartphone, now I feel secure about my data safety. Thanks for such a great post. Keep writing. How can I transfer data from My Blackberry 8530 to Android (ASUS Zenphone 2)? Thanks for sharing such a nice and informative article. This software prevents all these type of problems. Now I can easily save my phone’s data into my computer. Thanks, I needed a review for Wondershare mobile. 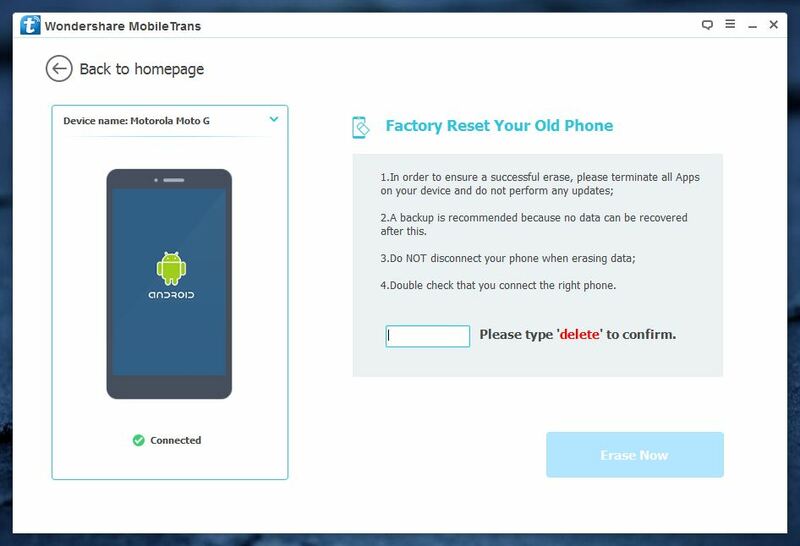 I just read this article, and I am glad to say I got me all stuff back recently my all phone backup was deleted after having this software I got everything back. Thanks for sharing this great stuff. I have been using this program since a long time. Thanks, I was actually searching for such a review. Thank you for sharing this nice informative article. This software protects all these kind of errors. Now I can easily save my mobiles’s data into my PC. Wondershare MobileTrans is a piece of software that will do all that for you. It is an application built with that exact purpose. It allows users to effortlessly migrate to a new smartphone. Dear Admin or Abhijith. Thank you for writing reviews about MobileTrans. I am Kathy from Wondershare. We have renewed our products Wondershare MobileTrans and changed its link into https://mobiletrans.wondershare.com/. Hope you can renew the link, thanks. Thank you for the review. I’ll give it a try. I’ve tried ApowerManager before and it’s great, but still, I need to compare with several other programs and then make a decision.